The Church was consecrated on 1st September 1633 by Robert Wright, Bishop of Coventry and Lichfield. Bishop Wright, who had been translated to Lichfield in 1632, garrisoned Eccleshall Castle for the King in 1642 and died there during the siege by Parliamentary forces in 1643. The Church was built as a private chapel by the founder, Thomas Broughton, 'a doughty man' partly out of his own goods and partly out of the goods of his late uncle Master Peter Broughton. The chapel's inside dimensions are given as 64 ft east to west and 37 ft north to south "or thereabouts". It was divided off by wooden pailings and furnished with a "well-built" Holy Table, Baptistry, Pulpit, "convenient seats", a bell and other unspecified "necessaries for divine worship". The deed of consecration suggests the chapel replaced an earlier pre-Reformation building. Its uses are specifically defined: public prayer, recitation of the sacred liturgy of the Church, preaching, the ministration of Sacraments of Holy Eucharist, Baptism, marriages, the churching of women, the burial of the dead, and for the family of Thomas Broughton to hear prayers and to enjoy the privileges set out above. 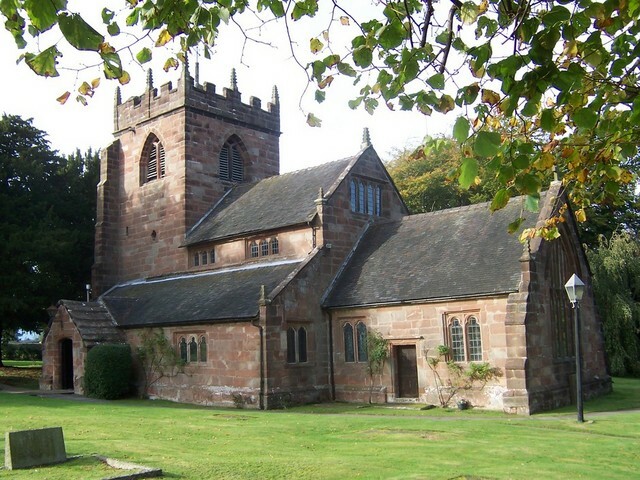 Baptisms and marriage of anyone other than members of the Broughton family or those living or staying or dwelling in the hall were forbidden except with the permission of the vicar of Eccleshall. Thomas Broughton had the right to nominate a suitable priest and the appointed chaplain was paid an annual stipend of £20. The chaplain had to be a graduate; a Masters of Arts, or at least a Bachelor of Arts. In addition 'a man of education' was to be appointed as parish clerk. Henry Bennett, who lies by the priest's door on the south side, discharged these duties during his lifetime. The church remained a chapel of east until 12th April 1907 when a district chapelry was assigned to it by Order in Council. On 20th February 1925 St Peters was united with Croxton creating the benefice of Croxton with Broughton, though the parishes remained separate. On 22nd June 1983 an Order in Council created the benefice of Croxton with Broughton and Adbaston, in 2000 the benefice of Broughton, Cotes Heath, Croxton and Standon was created and finally in 2008 the benefice of Ashley, Broughton, Croxton and Mucklestone.